In The art that made me, artists discuss works in the Art Gallery of NSW collection that either inspire, influence or simply delight them. This selection by Kevin Connor first appeared in Look – the Gallery’s members magazine. of the atmosphere of Circular Quay when I first started working. 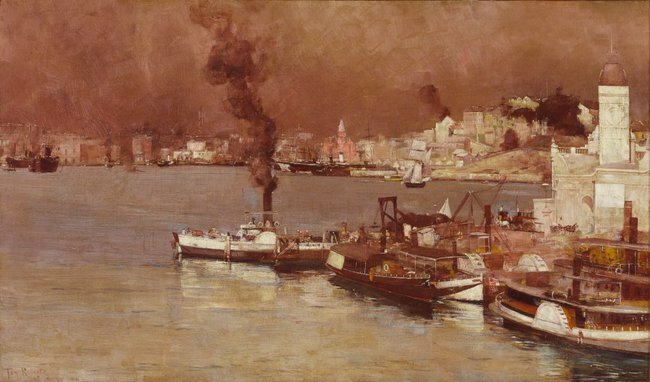 Port Jackson was still very much a great working seaport, and the city was heavy with small factories, crafts, second-hand bookshops, smoking chimneys, the patina of buildings neglected during the war years, cargo ships and tramp steamers, their crews from all parts of the world. In 2006, I did a large painting of Circular Quay, which was more or less a visual memory of over 70 years, through times when it was smoky and you could look down King Street and see the masts of cargo ships. It was often commented that it appeared to be seen through smoke. Well, it was, just as Roberts’s autumn morning is muted by smoke. We have a gouache by Mikael Larionov, Homme à la pipe et cavalier dans un paysage, that we bought through the Drouot [auction house], Paris, that was painted just after Larionov’s return to Russia from Paris in 1907. There is a man, smoking a pipe, a horse and a rider seen from behind, a dog barking and birds in flight. It immediately brings to mind the early works of artists like Nolan, Boyd, Hester and Tucker. It has the very simple and straightforward approach that is also found in the small Vassilieff paintings of Fitzroy in the ’30s. 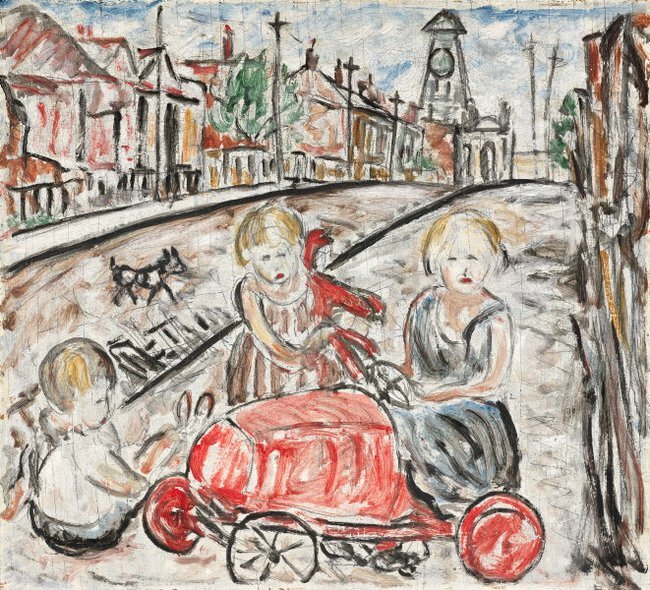 Was the Russian avant-garde, via Mikael Larionov and Vassilieff, through Paris to Russia, through Vassilieff via England and thence to Melbourne, the springboard for Melbourne’s young artists? I like to think so. 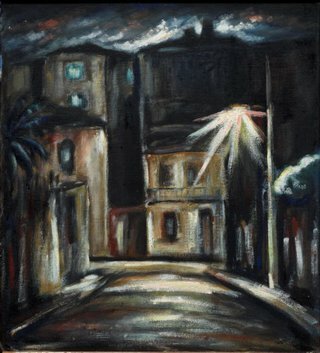 Hanging beside Fitzroy street scene is another Vassilieff, Nocturne no. 3, Commonwealth Lane 1936, in which it is not hard to see the early Tucker. I remember this was the first purchase of the Art Gallery of New South Wales Foundation. I was a Trustee at the time and it was a great win! A first-rate painting by a very underrated artist, at that time. 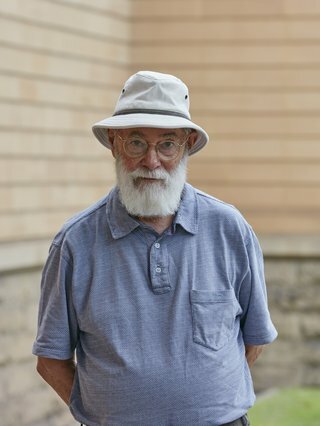 Now he is much closer to taking his place as one of the most important painters of the first half of the 20th century. He is an inspiration. 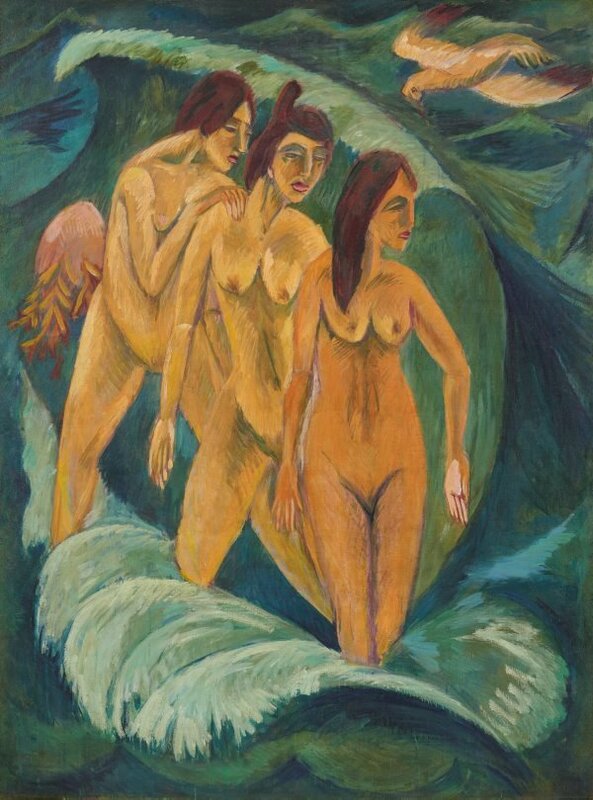 To have a major painting in the local gallery is to give our visual memory an entrance to all the great Kirchners we may or shall see over our years. While this is not really a great Van Gogh, it does give us a link to all the great Van Gogh paintings seen over the years. This little head is to me a key to the past, before the 10,000 books, films and tourist destinations made seeing Van Gogh with a fresh eye difficult. 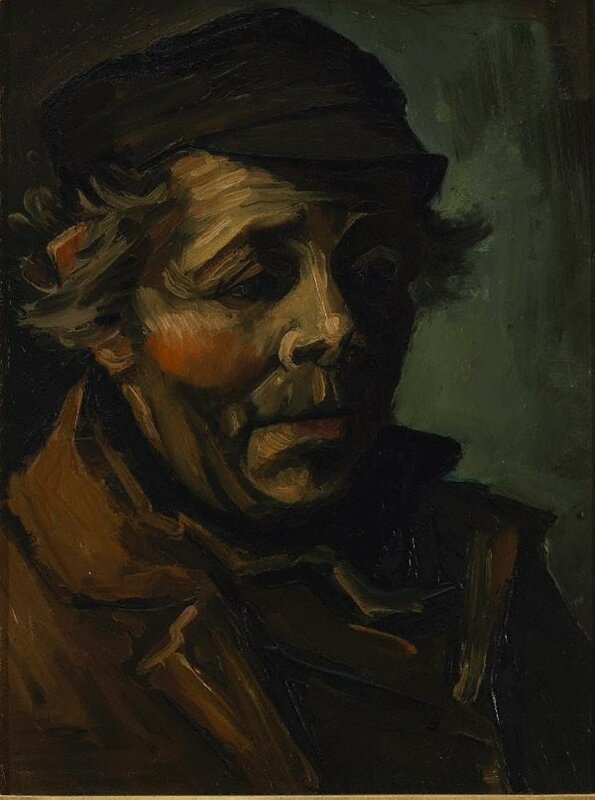 I remember saving up to buy, in 1951, a small book of Van Gogh reproductions, which I still have. Each time I open it my youthful excitement returns. He was a wonderful painter and if he had not died at 37 he might have wound up on the Riviera bashing out sunflowers at 80. It was his life, the obsession, the madness, the painting, the greatness. What a wonderful surprise to walk into the Gallery and see hanging this marvelous painting – full of Soutine's energy and ability to sustain his concentration, to work directly from the subject, to carry his honesty via mixing paint and placing it spontaneously, to bring alive without message! 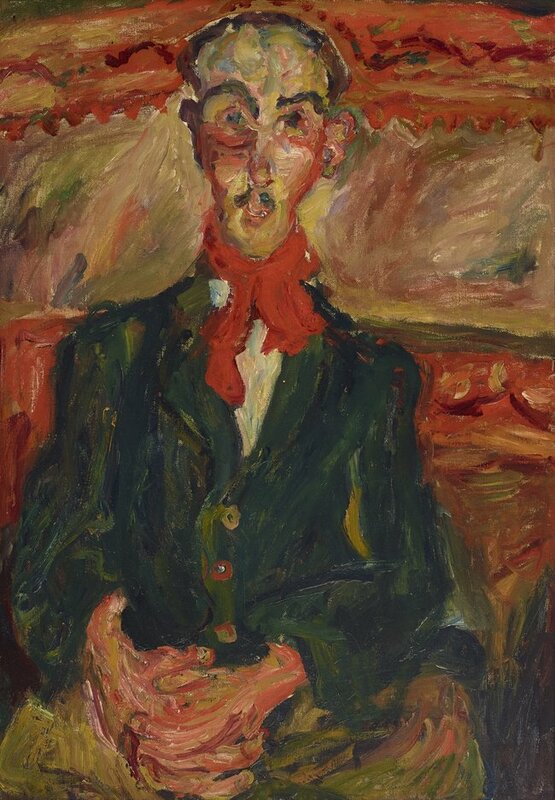 Chaim Soutine Man in a red scarf (L'homme au foulard rouge), The Lewis Collection © the artist, licensed by Viscopy, Sydney.